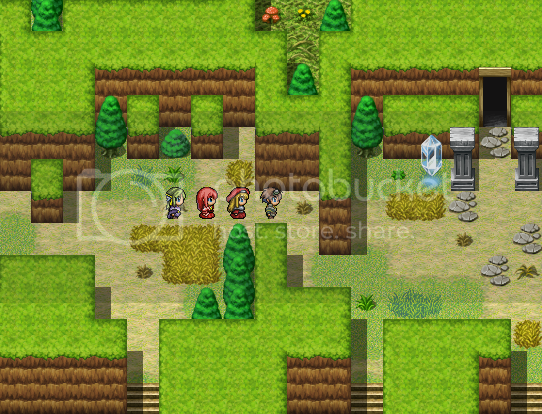 Legionwood is a console style RPG made using RPG Maker VX. Legionwood is my attempt at creating a nostalgic and familiar RPG experience reminiscent of the classics of the early 90's such as Breath Of Fire and Chrono Trigger. Legionwood features a massive world filled with adventures and side quests, and is expected to contain over 20 hours of gameplay and four huge story driven chapters. While it isn't revolutionary and contains gameplay that is for the most part bog standard RPG fare, Legionwood is designed to be that way; familiar and fun for RPG fans looking for a casual game to play. The world of Legionwood. Once upon a time, it was prosperous and full of technological wonders. About three thousand years ago, a mysterious phenomena demolished most of mankind's cities, and as a species, they had to start again. This much, archaeologists and scholars know from the ancient ruins of technological cities and fortresses dotted throughout the most barren parts of Legionwood's surface. After at least two millennia had passed, mankind had begun to re-establish itself as the planet's dominant species. Major inventions were being rediscovered, and technological development had finally reached a medieval period. It was at this time when everything began to go wrong. Legionwood has always had war, but suddenly, seemingly out of nowhere began a furious and unpredictable world war that raged for years and devastated cities and nations worldwide. This terrible conflict, known as the Great War, ended as suddenly as it began, with no mention of its cause or conclusion to the public, and mankind began to pick up the pieces. Now, one thousand years have passed since the Great War came to an end. Since that terrible time, makeshift peace treaties have ensured there have been only minor conflicts over the last centuries, but once again technology is on the rise, and half truths and legends about the Great War and its origins are prevalent in popular culture. festival to honor his new daughter's birth. Everybody in attendance is expecting a good time, but a key figure linked to Legionwood's dark past of conflict and death has been biding his time, and has decided that now is the perfect time to stage a new Great War and political upheaval. Simply looking for a way to wind down after months of hard work, Lann and his sister Liara come to enjoy the festivities, but soon they will both be pulled unexpectedly into an epic saga which may just have a battle to decide the world's fate waiting in its wings. - A character driven story full of twists, turns and red herrings, and an intended gameplay time of around 20 hours. - 6 playable characters, each one with a distinct personality, which you can mold into your own custom character classes to suit your combat style. - Turn based combat with an emphasis on tough opponents and using skills, rather than mashing "attack" over and over. Think, don't button mash! - A custom soundtrack, composed entirely of non comercial game music, some exclusive to Legionwood. - Collect, raise and summon 5 elemental spirits to aid you in battle! Summon level up, learn skills and fight just like your party members! - Innovative Ability Point system by KGC allows you to choose which bonuses you gain in level ups, so you're free to decide which role your characters fill in your battle plan. Im very fond of your pub layout, as well as, the consistent look of your game. 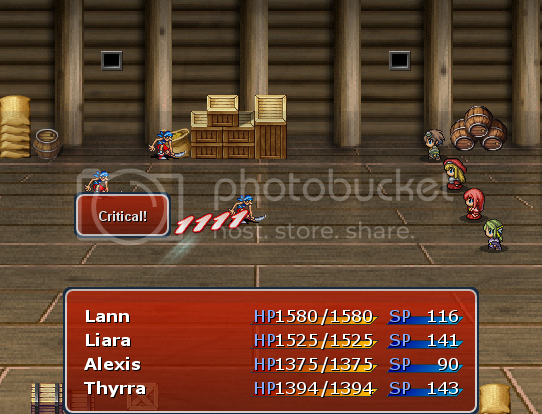 too many people mix tilesets or battlers that simply dont work together. I have to agree with you on that point. While I don't expect everybody to be an artist, and there's nothing wrong with finding tilesets from multiple sources, there should be some consideration used when designing games. The same goes with any aspect of game creation. In Dark Gaia's case, he has a style of consistency I think works well, in that it's simple in design without losing its effect. For this reason I must shame myself for not having played through the first game yet, so I best get to work on that. 7/10, better than the sequel. Niko, I've already commented to him about this in another forum. Let's all get back on topic with this thread. Yes, let's try not to spam, guys. 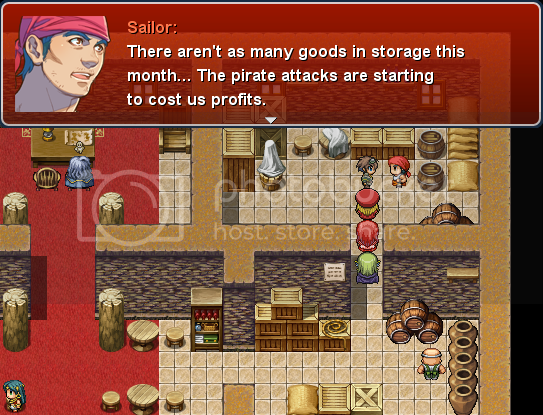 Anyway, thanks for the positive comments about the graphical style. I'm not an artist and I didn't make any of the graphics (though I extensively editing a lot of the tiles) but I did try to make sure to pick graphics that complement each other. I have yet to play this game. Dunno if this is acceptable, but I'm just leaving a comment here. This game is great so far (haven't finished it yet but I plan to) and I'm loving the open-endedness of the stat and tech system. My only major complaint is that there are many spelling and grammar errors in the parts that I've gone through (up until the Burkewych ruins dungeon). Not a whole lot, but the ones that were there were noticeable. Otherwise you've done a great job in re-capturing the feel of old RPG games (as I assume your intent was). I've only played 3 hours into the game and I've already recommended it to everyone on my other forum. I look forward to playing the demo of Legionwood 2, and eventually the full game as well! Good luck with making that game, and if there's anythin' I can do to help just throw me a message. Thanks for playing. In the Ultimate Edition release, I tried to go through and clean up all of the spelling/grammar errors though it's inevitable that I missed some. If you'd take note of any more that you find and send them to me in a PM, I'll be sure to fix them up. The 7 hour demo/Beta of Legionwood 2 is now out and I've had many people say that Legionwood 2 is much better than the first game, so you should enjoy it very much. Please keep in mind that I have plans to go commercial with it, but there will be plenty of opportunities to get the full thing for free (for example, by being a beta tester). Well I'd better finish the first game quickly so I can get in on the beta testing then! But yeah, do you want me to go through and screenshot all the errors or just tell you the general location? Was looking for a game to help give me ideas on what to do with my first RPG, and I must say that this game is AMAZING. I can see every hour you spent working on this thing, and I hope others do as well. I have a question for you. How do you get the "side-view" combat style, it is far better than the default, "head-on" thing. Thanks for any replies and also for this stunning game. Keep up the good work! Okay so I'm about an hour in (I just reached the first save point out-side of town) and so far I am loving it. I was instantly engrossed in the story and was constantly trying to figure out how everything fits together. Personally I love that kind of stuff, the kind of stuff that makes you think and try to figure out what in the world is going on and how it all fits together. It's great how much of the world you can interact with, boxes, crates, bookshelves, and just random people walking on the street. Each person has something to say that tells you a little bit about the world and hints at the story. As far as combat goes the way it is designed is brilliant. It is very skill and luck based, rather than just spamming attack. It is much easier to kill people using Tech's, but it also cost's 1/3 - 1/2 your mana (At least that's how it figures at this point). There is a good variety of gear so far, which makes it easy to build your characters in many different ways. The monster book (I forget what it's actually called sorry), is awesome. How it works is every time you kill a monster for the first time you get the info about that monster (Health, Stats, Rewards, ect.) 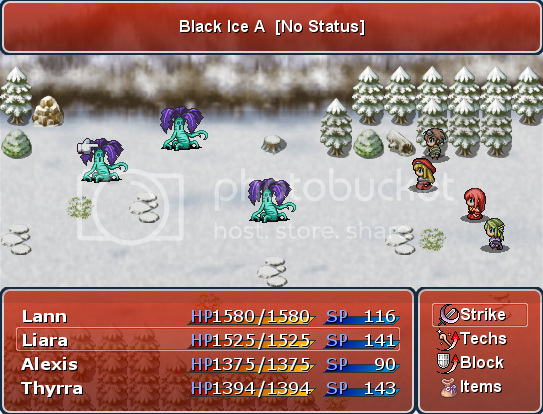 which is very useful when fighting these monsters because it allows you to strategize on what abilities to use on which monsters for the best outcome. I'll update this post as I get further into the game. I am loving it so far and would totally recommend it! Great Job! I am still absolutely loving it and I can't wait to play more! Hi! I'm glad you're enjoying it so far. It's important to note that the flow of the combat actually changes the farther you go into the game. In the later stages, you have a lot more SP, so using Techs isn't such a risky move, and the battles shift to having an emphasis on out skilling the enemies (as they're able to inflict far more statuses etc on you than earlier in the game) and this is where the actual build of your character becomes important. I'm also developing a sequel at the moment (currently available as a 7+ hour beta), so check it out! I just comepleted the entire game, not even 10 minutes ago, and what everyone above said is correct. Fantastic game, good story, and I even had one of those jump out of my seat boss victories that I fondly remember from RPG's of past. I would highly recomened this to anyone who could possibly be on this site. If you don't mind me asking though, which boss was it that gave you the memorable victory? The second (and final) fight with Merces was my favorite. Tough fight but perfect balance, with a lot on the line story wise. Ah, yes, I thought it might be that one. I worked hard to make it feel epic, both in how it played out and how it fit into the story. Trying this now, and I likes it! Just began, and I love the customization system and all! Look like a nice game. I've already download it I will give it a try tomorrow and come with some feedback about it.